Monday UPDATE UPDATE: Another brick in their wall. The Lego Movie is set to enter the record books with its $63.5M 4-day take, the largest Presidents Day sum ever. The interlocking blocks have deposited some $143M stateside in their first 11 days, $19M more than Frozen banked in the same period of time. Très impressive. Sunday UPDATE: Ain't no stopping the blocks. 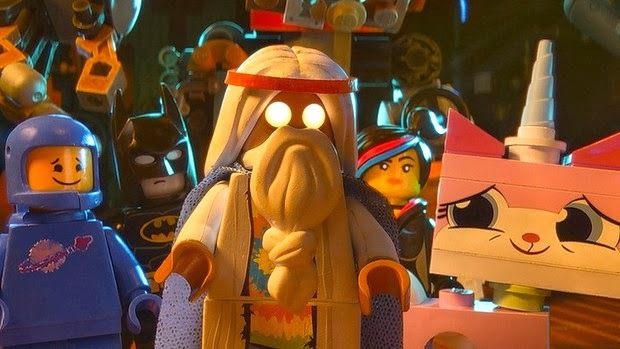 Make it two straight for The Lego Movie, walling off the competition again, dropping a precisely-what-we-predicted -29% in the bricks' sophomore frame, taking their two-week total to $129M. Well back in second, Kevin Hart's Midas touch continued as About Last Night won the war of the '80s remakes, taking full advantage of Valentine's Day, doing roughly half its business on Friday. Robocop played slightly better than projected though well off what Sony anticipated when green-lighting the reboot. Titanic, The Blind Side, Shrek, Avatar. All blockbusters of the ginormous kind which happen to share another illustrious feat: little-to-zero drop in their second weekend in theaters. Heck, the first three films of that foursome rose in their second frames. It speaks to through-the-roof word of mouth, precisely what those plastic bricks from The Lego Movie have going for them entering their sophomore frame. While lovers will choose pick one of this Valentine's Day weekend's '80s retreads – About Last Night and Endless Love – expect families and fanboys to continue flocking to the interlocking blocks in towering numbers. 1. The Lego Movie $49.5M - Repeat viewings buoy more big business for the bricks. 2. About Last Night $29.5M (↑) - Forecasting this weekend's wild card to open along the lines of November's The Best Man Holiday. 3. Robocop $17.25M (↔) - Horrid $2.8M debut on Wednesday portends a low-ammo weekend for the third of the three '80s remakes. 4. Endless Love $17M (↓) - Nicholas Sparks for the YA set. Could tank. 5. The Monuments Men $14M - What other options do adults have aside from months-old Oscar nominees? 6. Winter's Tale $9.75M (↓) - This literary sapfest is the second of our "flop watch" features.